Major League. Mirage Enterprises/Morgan Creek Productions 1989. This is one of those that I feel like I should have more preconceptions of than I do. It’s a “The Producers” kind of sandbagging scheme, only the sandbagger isn’t the protagonist. It’s just about a team that’s so bad they’re good, I guess. I can’t tell what the mohawked sunglasses-wearing baseball is trying to convey. Attitude? Eighties attitude? Am I reading too much into the mohawk that’s probably just for the Cleveland Indians? 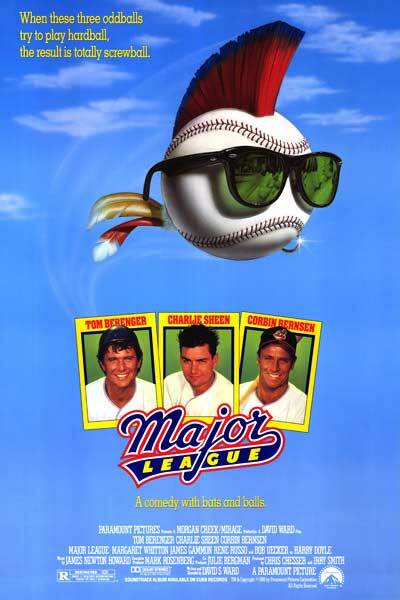 Kind of impressive that a movie could be made with a real pro sports franchise cast as the ragtag misfits. The only comparable example I can think of is The Mighty Ducks, and I think Disney money made the Ducks a real team after the fact. Maybe Angels in the Outfield, but the team is reasonably competent in that. There are some more familiar names lower down in the credits, but of the headliners, I only really know Charlie Sheen. When the owner of the Cleveland Indians dies, his showgirl trophy wife inherits the disappointing team and schemes to build the worst team in Baseball so she can escape the lease on the field and move the franchise to sunny Florida. The mix of unpromising nobodies and has-beens is indeed a dysfunctional wreck, but nobody told the seasoned coach that was the plan. While several players have their own subplots, the biggest is Jake Taylor trying to win back his definitely engaged ex-wife, which was handled in a way that was I was almost entirely unsympathetic to. In all but one of his encounters with her, he showed up uninvited, interrupting what she was doing and demanding attention. This falls off after the scene where he accidentally barges in on a party her fiance is hosting, but mostly because it’s the only scene we actually get to see what the fiance is like, and he’s a cartoonish passive-aggressive jerk to Jake, which is both deserved and meant to justify Jake’s quest. All of this does nothing but adds a “romantic” angle to the plot, almost completely disconnected from it. Jake doesn’t really earn her back, at least not in any way she would have known about, nor does he seem to learn anything to apply to the game. As a side note to that, I suppose it’s not too unexpected for a movie about a baseball team to not handle female characters in a dignified way, but it’s rather embarrassing that of the three I can think of, one is treated by Jake as his property to win back, which the narrative does nothing to contradict, one is a player’s wife who sleeps with another member of the team in revenge for her husband’s infidelity, and one is the main villain doing everything she can to make the team fail (and is mainly described as a former showgirl, and gets stripped in effigy to motivate the team). On the positive side, I loved pretty much every other subplot, and the balance of them all. In the larger “ragtag comic underdogs band together inspirationally” plot, it hit nearly every note perfectly, and was a lot of fun along the way. If anything, the introduction to the team showed too much of their potential. They had a guy who couldn’t hit the ball right but was an amazing runner, a guy with an uncontrollable but lightning fast pitch, and a guy who couldn’t hit a curveball to save his life but knocks fastballs into orbit. However, they don’t improve as quickly as one might expect. Similarly, Jake’s history of knee problems never quite paid off in the end, since I was sure they were going to give out in the finale. I particularly enjoyed Wesley Snipes’s character, and it was quite a change to see Dennis Haysbert, now best known for playing a US President and selling insurance, playing an intimidating Voodoo-practicing Cuban. I never see Charlie Sheen as anything in between “young pup” and “middle-aged manchild”, but he was fun to watch here, pulling out some nice insecurity. It’s odd that the climax hinges on a tiebreaking playoff for division championship, not the World Series. The last time I saw a film about baseball leave the World Series out, it was a historical movie and the real team lost that year’s Series. This fictional season doesn’t have that limitation, but I come to the conclusion that this way it not only allows the Indians to face off with the Yankees as their rival, which they wouldn’t be able to past regionals, but also lets the title hinge on one high-stakes game rather than a best of seven set. It didn’t have to be the Yankees, but they’ve been the team to beat for ages. I’m also surprised that the movie was written with the Indians specifically in mind. I only knew about the Chicago Cubs being as disappointing as the franchise in the movie, but apparently the writer is an Indians fan who wrote this as the only way he expected to see the Indians win a pennant. It also sounds rather like the Miracle Mets season. Despite a few things I really didn’t want to see, this was a fun experience that carried me along the expected path in a well-executed, organic way. It handled a large ensemble seamlessly, making it feel like a real team story even though the featured characters were only a small subset of the full team. Its legacy is well-deserved.